Do you remember your first casino experience? I do. It was my 21st birthday. My parents took me to Las Vegas as a birthday gift. It wasn’t exactly a Sin City experience since I was with family, but it was incredible nonetheless. I can tell you that I ate a lot of food, so much so that my one pair of jeans I brought with me barely buttoned up on the plane ride home. I can also tell you that my first spin at the Roulette wheel was $25 on the number 21. And I can tell you that I lost. Bottom line? Everyone remembers their first casino experience. And I guarantee that the 96 passengers aboard The Escapade Casino Cruise won’t ever forget their trip on the maiden voyage of what was supposed to be an excellent casino cruise. But they’ll remember the trip for all the wrong reasons. At about midnight on Wednesday morning, the 174-foot long Escapade ran aground about 1.8 miles off Tybee Island near Savannah, Georgia. The casino ship operated by Florida-based Tradewinds Casino Cruise was out for its maiden voyage. Pretty much all the passengers on board were invited to board for free, making the cruise even more special for those who decided to join the fun. Special, it was not. But memorable? Definitely. The passengers were stuck on the cruise for a good 12 hours before they were finally rescued. This got me thinking. Why would anyone on earth play casino games on a boat? Well, it turns out that you can’t play at local casinos in Georgia because they just don’t exist. Land-based gambling isn’t permitted, but hopping on a boat and traveling into international waters where casino games are legal is perfectly fine. Personally, I get nauseated on a boat. Couple that with the emotional roller coaster of playing casino games and you’ve got yourself a recipe for seasickness disaster at the tables. I’d much rather not play casino games at all than play on a boat, no matter how fancy and stable the boat might seem. And clearly in this case, the boat wasn’t really that safe at all. 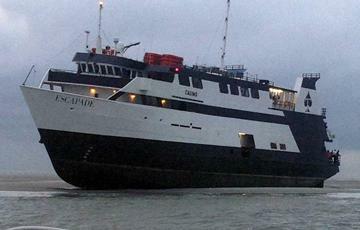 I’m willing to bet that the 96 stranded passengers won’t be playing casino games on a boat anytime soon. Thank goodness they’ve got the option to play at online casinos like Silver Oak Casino where the waters are calm.